If you are looking for a new and trusted PTC site to earn money online then Difbux is my top recommendation for you. Unlike other PTC sites, Difbux completely runs on their own custom script with unique features such as Achievement system, DifPrize, etc.. The sole purpose of Difbux is to achieve bigger success by becoming a leader in the PTC industry(just like Neobux). Difbux is owned by a company named “Naxuto Technology Communication Development Joinstock” which is located in Vietnam. Before I take you to Difbux earnings guide, let’s have a look at the review of Difbux and some Difbux Payment Proofs. 1: Difbux Review 2018: is Difbux a Scam or Legit? 4: How to earn money from Difbux? Difbux Review 2018: is Difbux a Scam or Legit? Difbux.com is a paid-to-click site, it was first introduced on 12th June 2017 in a pre-launch mode and was officially launched on 16 July 2017. As I said earlier, Difbux is owned by a company in Vietnam called “Naxuto Technology Communication Development Joinstock Company”. They specialize in online marketing, software development & outsourcing. And Difbux is their new Project. Difbux’s future plans are to run electronic currency exchange services for payment processors such as Payza, PerfectMoney, Payeer & AdvCash. And to launch more money making websites but the operating model for those sites will be different from Difbux. As of now, Difbux is not a scam PTC site because Difbux is paying instantly to all of its members via Payza, PerfectMoney and Payeer. You can find many payment proofs on their forum. A PTC site is called as Legit when it pays honestly to all of its members for at least 1 year. Since Difbux is less than a year old, it cannot be considered as a Legit PTC site, so as of now Difbux is considered as a paying site. The status of Difbux will change to legit as soon as it completes 1 year and continues to pay. The Difbux review is now complete. Below I have shared two of my latest payment proofs from Difbux. So far, I have received a total of 16 payments which sum up to $870.96, and all of my payments were made instantly. You can find more Difbux payment proofs on their forum. ► Anybody can earn money from Difbux without any investment. ► Difbux always pays instantly via Payza, PerfectMoney and Payeer. ► There is no limit on your earnings. You can earn as much as you can. ► Long-term plan with unique features. How to Earn Money from Difbux? As of today, there are 7 ways to earn money from Difbux. More earning methods are under development and will be introduced in the future. Now click on the SIGN UP button and create an account there by filling up the registration form. You can start earning money on Difbux from the below methods. Once you reach the min withdrawal limit($5) then you can withdraw your earnings instantly to your Payza or PerfectMoney or Payeer account. 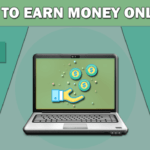 You can simply earn money from Difbux by viewing ads. There will be about 10 – 30 ads daily on Dfibux. As a standard member, you will earn about $0.03 – $0.04 every day (You can upgrade your account to increase your earnings). You will also earn 1 point for viewing 1 ad. The points can be used to extend or recycle your Rented Referrals. 2: Click on the view ads button which is located on top. 3: Now you will be able to see some advertisements displayed on the page, similar to the ones shown in the below image. 4: Click on any ad, a blue dot will appear >> then click on the blue dot >> a window will open and the timer will start running after the page loads completely >> wait for few seconds until the timer runs out >> money will be credited to your account >> close the window. Repeat the step 4 to view all the advertisements. By viewing ads you can only earn about 3 – 5 cents daily but don’t worry as there are more methods to earn from Difbux. On 31 Dec 2017, Difbux announced a new feature called as DifPrize which works very similar to AdPrize on Neobux. For every ad you view, you will get 3 chances to play DifPrize which will be valid for 2 hours. The more ads you view the more chances you will get to play DifPrize. To start playing DifPrize you need to click ads, then click on the DifPrize button which will be present at the bottom-right corner of your browser. After you click on that button, a new window will open and a timer will start running. After the timer ends, the result will be displayed. If you do not win anything then keep clicking on the “Next” button becasue the more you play the more will be the chances for winning. By completing offers on Difbux you will earn DifCoins. Different offers will give you a different amount of DifCoins. The Difcoins can be converted into main balance and the conversion rate is $1 per 1000 DifCoins. To start earning money from Difbux Offers, click on Offers tab. Now you will be able to see some offers. Read the instructions to complete the offer and click on it to begin the offer. To complete offers for mobile, click on the mobile tab to see the offers available for mobile phones. 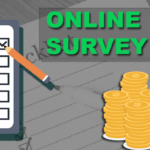 Surveys are another great way to earn money from Difbux. You will earn DifCoins for completing Surveys and that can be converted into money. 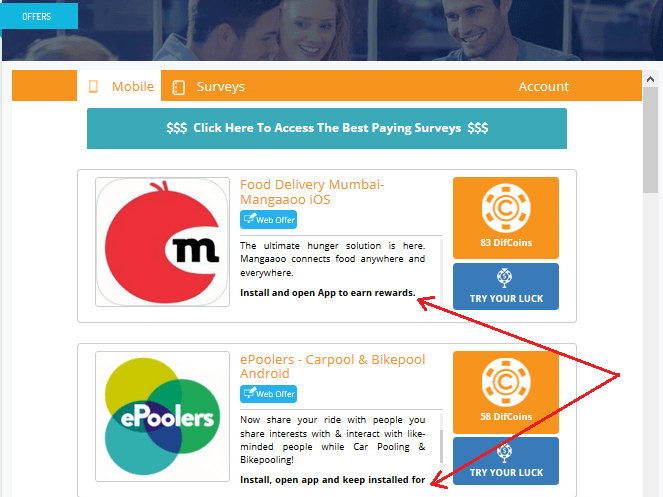 To start earning money from Diffbux Surveys, click on Surveys menu. Now you will be able to see surveys page as shown below. Next, you will be asked to wait for 15 seconds, after that you have to select your language. Then you have to answer some simple questions about yourself. 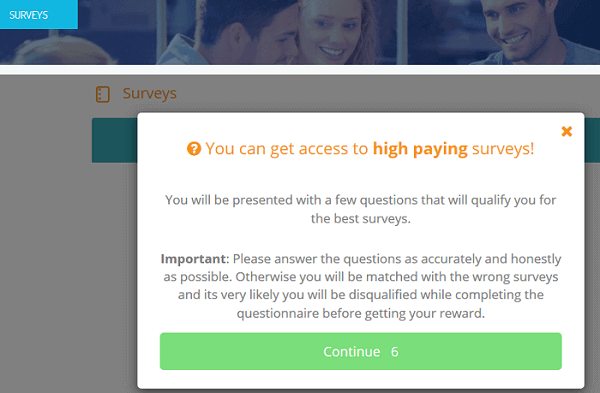 After you have answered all the questions, you will be able to see all the surveys available for you. Now you can start taking surveys by clicking on each survey and by giving your opinion on all the questions asked. Difbux has 4 kinds of Achievement system and they are categorized as Clicks, Referrals, Laboriousness, and Investor. There are 20 medals in each category. 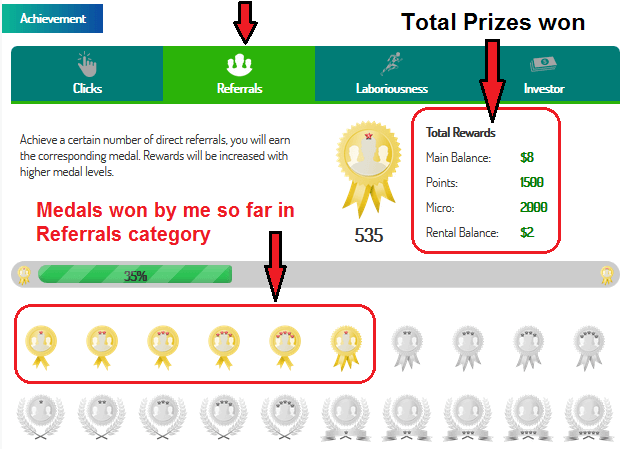 In the below image, you can see my medals that I won for getting Direct Referrals. I have won medals in other categories as well. For achieving each medal, you will be rewarded with Main balance, Rental balance, Points and advertisement credits. Clicks Medals: You will be rewarded with a Clicks medal when you reach a certain number of advertisement clicks. For example, when you reach 100 clicks then you will get clicks medal 1, when you reach 500 clicks then you will get clicks medal 2, etc.. Referrals Medals: You will be rewarded with a Referrals Medal for reaching a certain amount of direct referrals. For example, when you reach 50 direct referrals then you will get Referrals medal 1, when you reach 100 Direct referrals then you will earn clicks medal 2, etc..
Laboriousness Medals: You will get this medal for being active. This medal is based on the number of EXP you have. For example, if you click 4 ads daily then you will win 1 EXP and if you click 4 ads daily for 10 days then you will win 1 additional EXP. 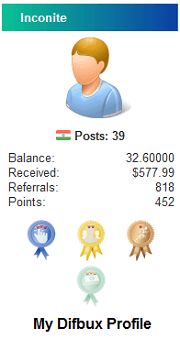 You can also earn EXP for useful posts on Difbux forum. And when you have a certain amount of EXP then you will be awarded with a Laboriousness Medal. Investor Medals: You will be awarded with an Investor medals for investing a certain amount of money. This way one can earn medals from Difbux from free. Diffbux has this achievement system to encourage members. If you have direct referrals on Difbux then it will be a huge bonus for you because you will earn commissions based on their work. Direct referrals are people who join Diffbux through your referral link. 1: You will earn a certain % of commission when your direct referrals click Fixed Ads. For example, as a standard member you will earn $0.0005 per DR click, if you are a Golden member then you will earn $0.005 per DR click and if you are an Ultimate member then you will earn $0.01 per DR click. 2: You will also earn 10%(as standard), 15%(as Golden) and 20%(as Ultimate) commission when your Direct referral completes offers & surveys. 3: If you a Golden or Ultimate member then you will earn 2% commission from your referrals when they upgrade their account or make a purchase. To get Direct referrals promote your referral link in Facebook groups, WhatsApp groups, ask your friends, aunts, etc.. to join Dufbux using your referral link. Rented referrals are people who can be rented to work for you for 30 days or even more. The price for renting each referral is $0.20 and you will earn $0.005 per click(as Standard) and $0.01 per click (as Golden or Ultimate member). Members purchase rented referrals to make profits. If you have a good RR strategy then you can make huge profits from Difbux. If you are a standard member or upgraded member then rent a number of referrals that you can afford. The price of each rented referral will be $0.20. To make good profits you should extend your referrals for longer periods of time to get discounts. For example, if you extend your referral for 90 days then you will get 18% discount, 25% discount for 150days and 30% discount for 240 days. This way you will make good profits from your rented referrals because BEP(Break Even Point) will be low if you extend for more number of days. Read the below Difbux strategy to learn how to make profit from your rented referrals. I follow this Difbux strategy to make good profits. You can also follow the same Diffbux strategy to make huge profits. Tip 1: Click all ads, play DifPrize and complete few offers & Surveys every day. Tip 2: Rent a limited number of referrals and extend all of them to more number of days to get discount. For example, if you are a standard member then you can rent a total of 200 referrals. The price per each rented referrals is $0.20 for 30 days. If you rent 200 referrals then the price will be $40 for 30 days and if you extend all of your referral for additional 240 days then it would cost $1.12(30% discount) per each referral. So, the total price for extending 200 referrals for 240 days will be $224($1.12 * 200). Now the total amount spent on 200 referrals for having them for 270 days(30 + 240) is $264($40 + $224). As a standard member you will earn $0.005 per RR click and if your referrals click average is 1.4 daily then you will earn $0.005 * 1.4 * 200 = $1.4 every day. So your daily earning will be $1.4, and your earnings for 270 days will be $1.4 * 270 = $378. This way you will make $114 ($378 – $264) pure profit from 200 rented referrals in 270 days. If you are an upgraded member then follow the same procedure to make huge profits from your rented referrals. Tip 3: Promote Difbux referral link in Facebook groups, forums, other PTC sites, etc.. to get more and more number of Direct referrals. When you get 100 Direct referrals clicks a day then I recommend you to upgrade your account to Golden($90) membership because as a Golden member you will earn $0.50($0.005 * 100) per day from 100 DR clicks. Also as a Golden member, you will have 9 ads available of value $0.01 so you will earn $0.09 daily by clicking those ads. And $2.7 ($0.09 * 30) per month. So in total, you will make $17.7 ($15 + $2.7) every month. That makes $212.4 a year profiting $122.4 ($212.4 – $90). These days they are many PTC sites that are scamming people within few months after their launch but in my opinion, Difbux will not follow the same path as those scammers did. Difbux has already gained lots of trust in the PTC industry by paying instantly since the beginning. The upgrade plans, margin of profits are very well managed indicating a very successful long-term run. My recommendation for you is: just join Difbux and be active for few days and if you feel the trust then continue to work there and have bigger goals. 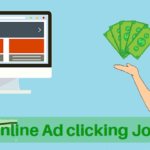 If you love to earn money by clicking ads then see the list of best PTC sites here. If you have any doubts regarding PTC sites or Difbux then feel free to commend below. Hello I just joined but it is slow to open adverts on view adverts, managed to view only one ad. Oh! but Difbux loads absolutely faster always. Maybe you should try doing that again. Enter your email address to receive notifications of new money making tips directly into your inbox.